This post is inspired by a Facebook friend who’s also a gardener. She often asks in a group we belong to “what’s on the menu tonight at your place?” and follows with gorgeous meals she’s prepared for her family. I thought it’d be lovely to share our family celebration with you all tonight. Uni exam results came out today and my crew both got outstanding marks – my household has plenty to celebrate! So tonight we decided on a favourite simple, healthy meal. 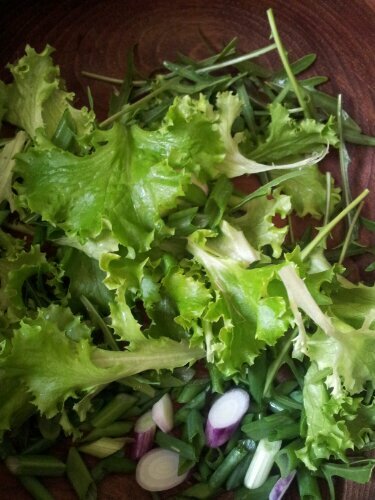 I picked wild rocket, endives, young silverbeet, spring onions, tender new kale and some surprise new lettuce that self-seeded from last year. A little grated carrot (mine aren’t ready yet), some chopped young mushrooms and cubed Danish Fetta cheese completed the combo. 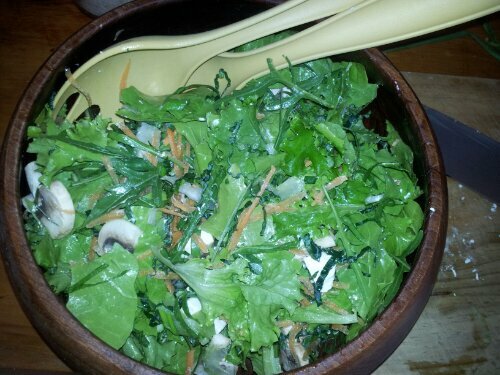 I don’t like a lot of dressing on my salads, and use just a drizzle of sesame oil and a sprinkle of rice wine vinegar. 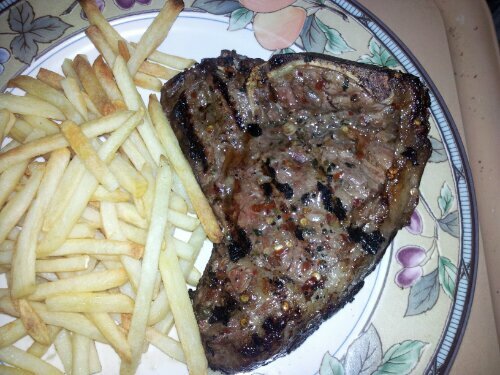 The end result was just scrumptious – and we had it with oven fries and barbecue steak. Previous Whining and Winning Next Looking Forward to 2014!